Biggie today surprised the Housemates with another special. That was non other than Banky W. Immediately as he entered the House, all of the inmates started cheering him with shouts of joy for seeing a popular . Collectively females Housemates took him on a quick tour around Biggies House before coming back to the lounge where they all collected for a moment of conversations. They started with a meet and greet individually as they talked about themselves and showcased their talents, before him which later on delved into an advise session. Banky used his odd journey in the entertainment industry to try motivate the Housemates into being true to themselves first. He added advising them to be comfortable with their inner talents, and use that as a spring board to launch themselves into their real character. On his exit the Housemates seemed like they had spent a few seconds as a whole they let out a cry of disappointment as the buzzer sounded,marking Banky’s end of the visit. Despite of the Baza sounding the Housemates went on and demanded him leave a piece of himself behind, Debie-Rise managed to win her self a ring and his bracelet also stayed with Uriel. 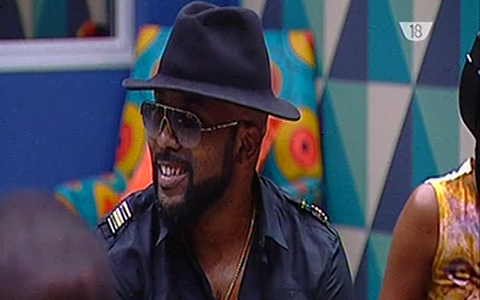 Banky fed the Housemates with advice and some words of encouragement. Let’s hope they will surely ring in the Housemates’ minds from now to their future. I am voting to save Marvis and Thin Tall Tony.